ONLINE TICKET SALES HAVE CLOSED FOR THIS EVENING. Limited tickets for Friday night’s event ONLY will be available at the door between 8PM and 10PM. No Saturday tickets will be honored for Friday’s event. As night falls across Green-Wood, step through the iconic Gothic Arch and into an unforgettable experience of ethereal sights and sounds. 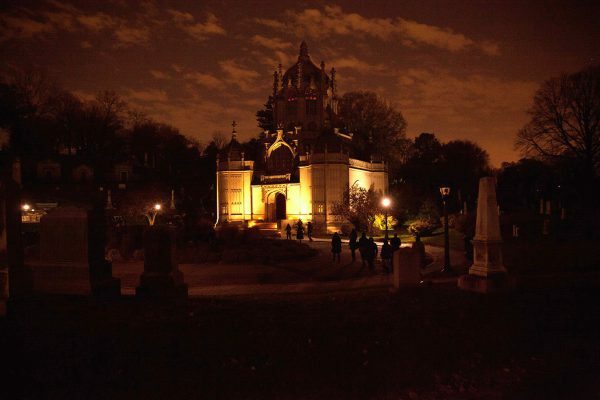 Guided by the thousands of flickering candles, you’ll wander along the Cemetery’s winding paths and have chance encounters with musicians, moving images, performance artists, and storytellers. It all takes place against the stunning backdrop of one New York City’s most historic and storied landscapes, lit by the light of the silvery moon. Creative Team: music curators Unison Media (“Crypt Sessions” and “Angel’s Share”); independent film producers Rooftop Films; purveyors of the arcane Morbid Anatomy; and performing arts powerhouse Bindlestiff Family Cirkus. This event is strictly 21+; I.D. required. Attendees will be walking through the Cemetery at night, appropriate attire is recommended. Programming on both nights is identical. Tickets are only valid for the date of the reservation (i.e. you may not switch nights). We regret that the venue is not handicap accessible. There is no onsite parking available for this event. Doors close at 10PM. No admittance after 10PM. Click here for all of our membership levels and information.